Need a car on the cheap? Don't want one of those crazy 97-month car loans they offer now? Then head on down to your local New York City public auction for the deal of the century: cars as low as $300 just because they were obliterated during Hurricane Sandy. The New York Post reports that city officials couldn't locate the owners of some 535 cars during last year's hurricane, so they began auctioning their vehicles off this week. Bargain hunters are apparently making a gamble on many of the cars, even though they don't have keys, can't be registered for road use without an inspection, and are quite possibly only good for spare parts. Still, he suggested buyers looking for cheap wheels should be aware of the risks. 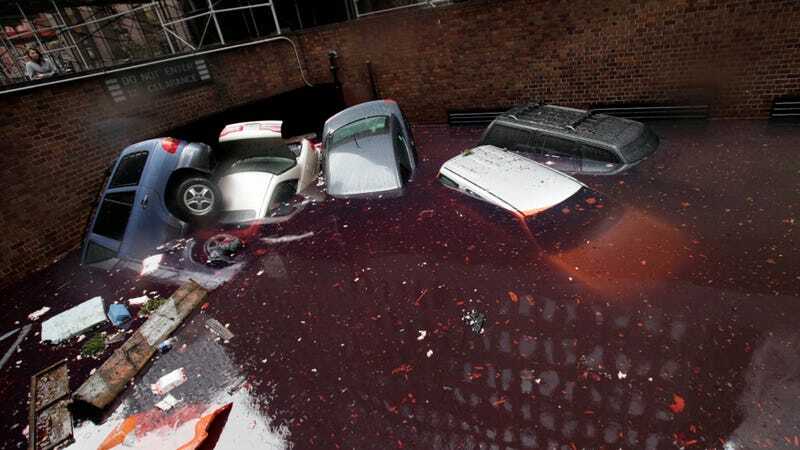 Cars submerged under salt water are usually destined for the scrap heap. But water didn’t reach the engine blocks in some vehicles, offering hope to those stalking bargain transportation. “To some degree, it’s a gamble,” Maltz conceded. You hear that? To SOME DEGREE it's a gamble! That's barely even a warning at all. Maltz told the newspaper that they have "a real smorgasbord" of vehicles ranging from flooded compacts to flooded high-end luxury cars. Some cars were sold on Tuesday and more will be auctioned on May 2 and May 7. Maltz's website doesn't have a full list of the cars for sale yet, but we'll have to keep an eye on it. There may be some real gems in there somewhere. Anyone willing to give a Sandy-flooded car another shot?